The present contribution reports on the features of platinum-based systems supported on vanadium oxide nanotubes. 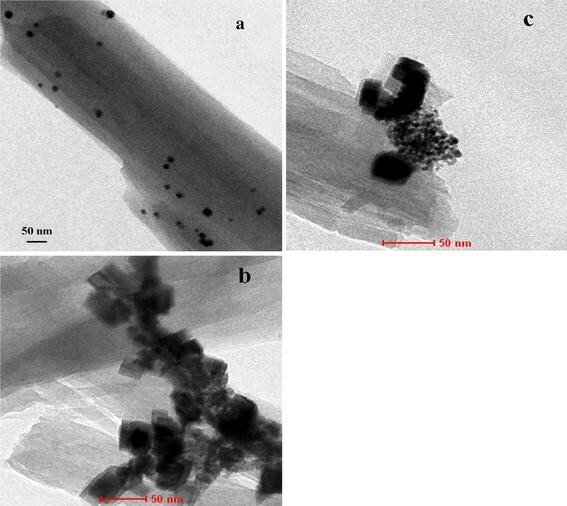 The synthesis of nanotubes was carried out using a commercial vanadium pentoxide via hydrothermal route. The nanostructured hybrid materials were prepared by wet impregnation using two different platinum precursors. The formation of platinum nanoparticles was evaluated by applying distinct reduction procedures. All nanostructured samples were essentially analysed by X-ray diffraction and transmission electron microscopy. After reduction, transmission electron microscopy also made it possible to estimate particle size distribution and mean diameter calculations. It could be seen that all reduction procedures did not affect the nanostructure of the supports and that the formation of metallic nanoparticles is quite efficient with an indistinct distribution along the nanotubes. Nevertheless, the reduction procedure determined the diameter, dispersion and shape of the metallic particles. It could be concluded that the use of H2PtCl6 is more suitable and that the use of hydrogen as reducing agent leads to a nanomaterial with unagglomerated round-shaped metallic particles with mean size of 6–7 nm. Amongst the nanostructures that have been intensively studied over the last years, nanotubes are rather attractive as the tubular morphology allows accessing three well-defined contact regions, namely the inner and outer surfaces as well as the tube ends. Nanotubes of transition metal oxides are particularly interesting, but these one-dimensional nanostructures have only drawn scientists’ attention in the late 1990s stimulated by the first report on the synthesis of vanadium oxide nanotubes . Since this discovery, research efforts have mostly been focused on preparation methods aiming at establishing reproducible soft chemistry routes operating at moderate to low temperatures and using aqueous media [2–5]. The intense work dedicated to this matter is encouraged by the wide range of possible applications, particularly in electrochemical systems, nanocomposites and catalysis. Nonetheless, it is important to note that, in spite of this ever-stimulating potentiality, a detailed investigation into the response of such nanostructures associated with some of those applications is rather scarce in the scientific literature. The formulation of hybrid nanostructures based on nanotubular materials of transition metal compounds, in particular vanadium oxide nanotubes, is especially interesting. These nanomaterials possess different oxidation states  and, consequently, feature distinct redox properties, which may decisively dictate the reaction pathways and the product distribution in oxidation processes at which vanadium species are active. Additionally, processes that involve the use of bifunctional catalysts containing both redox and metallic sites can be included as potential target applications for such hybrids. The preparation of noble metal-based hybrids using tube-shaped vanadium-based nanomaterials has been rarely reported so far. Mining the literature, the contribution of Zhang et al. can be appointed as one of a very few. They have successfully reported the preparation of well-dispersed Pd nanoparticles, with a size distribution within 7–13 nm, on the surface of vanadium oxide nanotubes and showed that the composite is electrocatalytically active for methanol oxidation. Later on, the same group has also reported the synthesis of Ag-modified vanadium oxide nanotubes and explored their antibacterial properties . A few other approaches for different metals have been described by some authors as well. In those cases, copper could be incorporated into the vanadium nanotubes by ion-exchanging the template with a solution of copper(II) salt , whereas gold was added by using a colloidal solution with metallic nanoparticles . However, much must still be done to accomplish a more general approach to design metallic nanoparticles–vanadium nanotubes hybrid materials. The synthesis of nanostructured solids comprised of well-crystallized nanoparticles with controlled shape and size on the surface of vanadium oxide nanotubes, preserving their structural and morphological features, is still challenging. This motivating fashion has recently inspired us to study the chemical stability of this vanadium oxide nanotubes focusing on the conditions normally used during the preparation of heterogeneous catalysts . The results showed that it is strictly necessary to rigorously control the conditions of noble metal impregnation because of the susceptibility of the nanotubes to strong acid or basic media. In this present contribution, the design of hybrid nanostructured materials is addressed with special focus on the formation of platinum nanoparticles located on the surface of vanadium oxide nanotubes. The effects of different reducing agents and treatments on the structure and morphology of the metallic nanoparticles as well as on the integrity of the nanotubular support are reported. Vanadium oxide nanotubes were synthesized from a commercially available V2O5 (Merck). The oxide was firstly added to an ethanolic solution of hexadecylamine (HDA) used as structure-directing agent (21.6 mmol HDA/35 ml ethanol), and the suspension was constantly stirred for 2 h. After that, 45 ml of distilled water was added into the alcoholic slurry, and the final suspension was allowed to hydrolyse for 48 h at room temperature under vigorous stirring. The synthesis was performed at a 1:1 V2O5:HDA molar ratio. The resulting orange composite was hydrothermally treated in Teflon-lined stainless steel autoclave for 7 days, at 180°C. It was then cooled down to room temperature, and the black powder formed was filtered, extensively washed with ethanol and hexane and finally dried for 10 h, at 100°C [11, 12]. 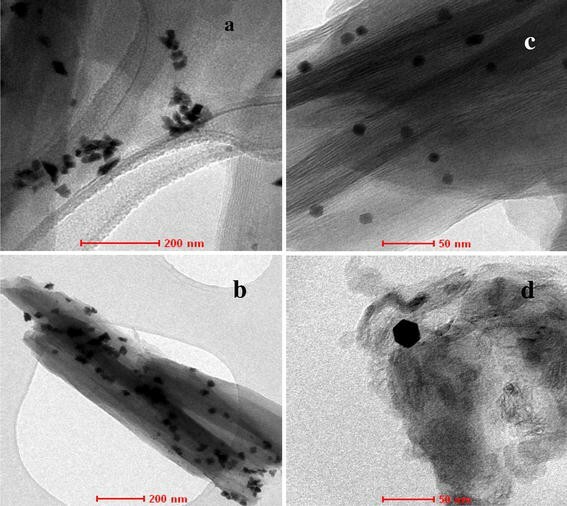 Platinum-based materials were obtained by impregnating the vanadium oxide nanotubes based on the procedure described previously . Briefly, the nanotubes were dispersed in an aqueous solution of the metal precursor (H2PtCl6 or (NH3)4Pt(NO3)2) at a concentration calculated to result in 1 wt.% Pt nominal loading. The suspension was stirred for 24 h, and then the excess of water was removed by filtration. The solids were washed with water, dried at 100°C for 10 h and named according to the metal precursor used: Pt/VNT-C for chlorine-containing precursor and Pt/VNT-N for the nitrate salt. The impregnated samples were submitted to different reduction procedures in order to generate dispersed metallic platinum nanoparticles. A sample was firstly reduced in liquid phase using a glycerine:water (5:1) solution as reducing agent. The suspension containing the catalyst (1 g/100 ml) was treated in autoclave for 5 h at 160°C and autogenous pressure. It was then allowed to naturally cool down to room temperature followed by filtration, washing with water and drying; generating the sample Pt/VNT-CG. In a second method, the sample was reduced under reflux for 18 h in a glycerine:water (3:1) solution, keeping the same 1 g/100 ml ratio in the suspension. Next, it was filtered, washed and dried providing the samples Pt/VNT-CGR and Pt/VNT-NGR. Finally, a third sample (Pt/VNT-CH) was obtained by using hydrogen as reducing agent. This more conventional gas-phase procedure was carried out at 215°C (1°C/min), under a 30 ml/min hydrogen flux, for 5 h.
All prepared samples with their respective platinum precursor and reduction procedure are described in Table 1. The supports and hybrid materials were characterized by X-ray diffraction (XRD), scanning electron microscopy (SEM), (high-resolution) transmission electron microscopy (TEM/HRTEM) and infrared spectroscopy (FTIR). XRD was conducted using a Rigaku Miniflex diffractometer with CuKα radiation, operating at 40 mV. The measurements were carried out with 2θ ranging from 1° to 60° at a scanning rate of 0.01°/s. 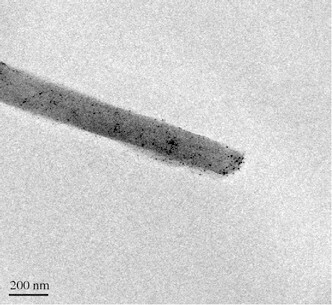 The as-synthesized nanotubes were imaged with a JEOL JSM-5800 LV microscope equipped with a secondary electron detector. where x i corresponds to each individual value, is the arithmetic mean and N the total number of values. Physical chemical properties of vanadium oxide nanotubes (VNT) have been shown to be sensitive to the starting materials and the synthesis procedures, especially the vanadium source, alkylamine used as structure-directing agent and the hydrothermal conditions applied. Therefore, a first examination of their structure and morphology is mandatory. The X-ray diffractogram (Fig. 1), some representative scanning (Fig. 2) and transmission (Fig. 3) electron microscopy images of the material prepared for this work reveal that it is rather consistent with our previous work , evidencing the reproducibility of the synthesis procedure used. As discussed in detail previously , the XRD pattern (Fig. 1) shows low angle (2θ < 15°) features consistent with the 00l planes expected for the VNT ordered lamellar structure. Other less intense reflections are also observed at 25° ≤ 2θ ≤ 50°, which are related with the hk 0 planes of the VO x bidimensional structures. 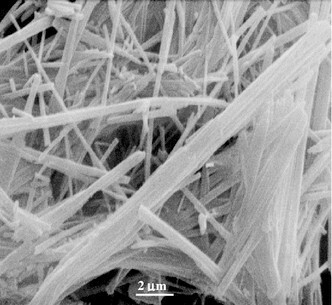 A general impression of the prepared sample is provided by the SEM image (Fig. 2), which evidences the successful formation of the tubular morphology. 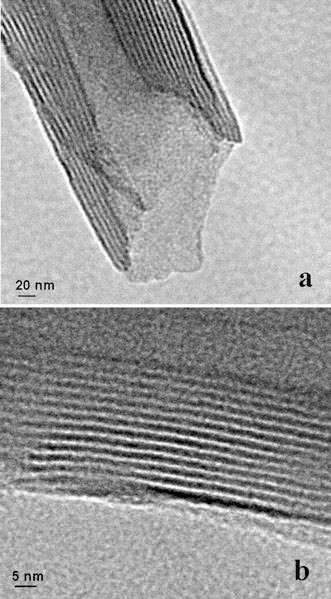 Details of the as-synthesized nanostructures could be observed in TEM/HRTEM images (Fig. 3a, 3b). The nanotubes are formed by multiple layers with open ends (Fig. 3a), composed of approximately 13–16 layers (Fig. 3b) and showing inner diameter in the range 30–50 nm and outer diameter of 150–200 nm. Although it varies along the nanotube extension, the average value of the interlayer distance (d = 3.48 nm) based on TEM images is consistent with the chain length of the HDA template used in the synthesis [12, 14]. The XRD (Fig. 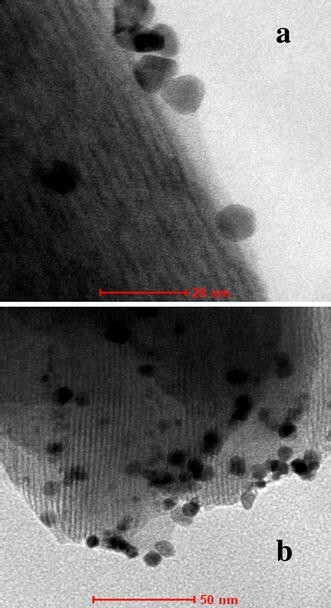 1) and TEM/HRTEM analyses of the platinum–vanadium oxide hybrid materials revealed that the one-dimensional nanostructure is preserved under the conditions used for the preparation of the catalysts. The effectiveness of the three reduction processes applied to the impregnated samples was essentially evaluated by TEM/HRTEM analysis. It could be seen that all methods could successfully reduce the platinum ionic species and generate well-crystallized multi-faceted metallic platinum nanoparticles. It was also observed that such nanoparticles were indistinctly located throughout the nanotubes as they could be undoubtedly imaged along the length as well as at the tube ends. A low-magnification TEM image of one representative hybrid sample is depicted in Fig. 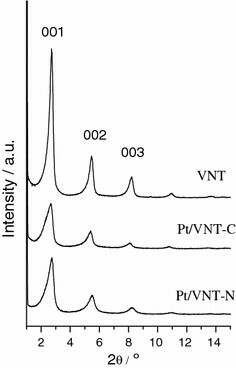 4 in order to exemplify the overall distribution of metallic platinum nanoparticles on the surface of the vanadium oxide nanotubes. It is important to stress, however, that the detailed examination of TEM images clearly evidenced that some features of the nanoparticles, particularly shape, size and dispersion, are determined by the reduction process parameters. Initially, mild reduction conditions were applied, and aqueous solutions of glycerine were used as reduction agents; the liquid-phase procedures aimed at preserving the nanotubular structure of the hybrid catalyst. The materials prepared with the nitrate precursor and reduced in an autoclave under autogenous pressure (Pt/VNT-NG) presented large round-shaped nanoparticles (Fig. 5a). 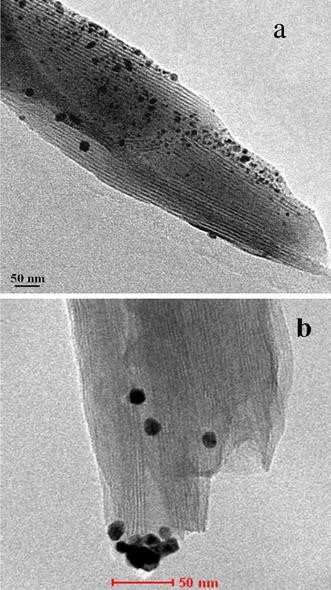 Metallic agglomerates were often found at the ends of the nanotubes as representatively shown in Fig. 5b. The hybrid nanostructure Pt/VNT-CG obtained by the use of a chlorinated platinum precursor showed to be comprised of large nano-polyhedra particles (d > 18 nm). Even though nanoparticles were also formed along the nanotubes (Fig. 6a), an interesting pattern concerning the growth of agglomerates could be envisaged for this sample. The clusters formed by extremely large particles (~30 nm), which were regularly found in this nanomaterial (Fig. 6b), are suggested to be produced from close spatial arrangements of several smaller nanoparticles (3–6 nm) during the reduction process. Figure 6c is a well-representative image of this process as it depicts both large agglomerates and small nanoparticles clustered to form them. Other two glycerine-reduced samples were generated by using a reflux apparatus in substitution to the autoclave. In these samples, however, dramatic differences in the nanoparticle shapes were accomplished. As for the Pt/VNT-NGR hybrid nanomaterial, small dispersed agglomerates of platinum nanoparticles bearing lengthy prismatic shape and irregular distribution are observed (Fig. 7a). On the other hand, sample Pt/VNT-CGR presented well-dispersed polyhedron-shaped particles (Fig. 7b, 7c). Unfortunately, the method also brought up some drawbacks to this nanotube-based hybrid since a portion of the nanostructure was found to be destroyed during the process as displayed in Fig. 7d. An overall analysis of TEM images of the different regions of the samples generated by liquid-phase reduction indicates that the use of H2PtCl6 as the metal precursor favours the successful deposition of platinum particles in the vanadium oxide nanotube hybrids. This methodology leads to better distributed particles exhibiting a more homogeneous profile concerning their shape and position. In view of these findings, the chlorine-based sample was also reduced by the activation method conventionally used in heterogeneous catalysis, i.e. using hydrogen as reducing agent. In this case, a more rigorous temperature control was necessary as the thermal stability of the one-dimensional nanostructure is limited by the amine decomposition temperature (usually above 250°C) . Thus, the hybrid material was treated at 215°C, following a heating rate of 1°C/min. The images of the resulting sample, Pt/VNT-CH (Fig. 8), show that the reduction conditions were satisfactory once the support preserved its original structure. The sample revealed to be comprised of a great number of platinum nanoparticles extremely well dispersed along the nanotubes. These nanoparticles exhibited quite regular rounded shape (Fig. 8a) and a significant low agglomeration state. The presence of the metallic nanoparticles could be observed over the whole extension of the nanotubes, with a good distribution. However, once again it could be observed that those nanoparticles formed at the tube ends (Fig. 8b) are slightly larger than those generated along the nanotube length. 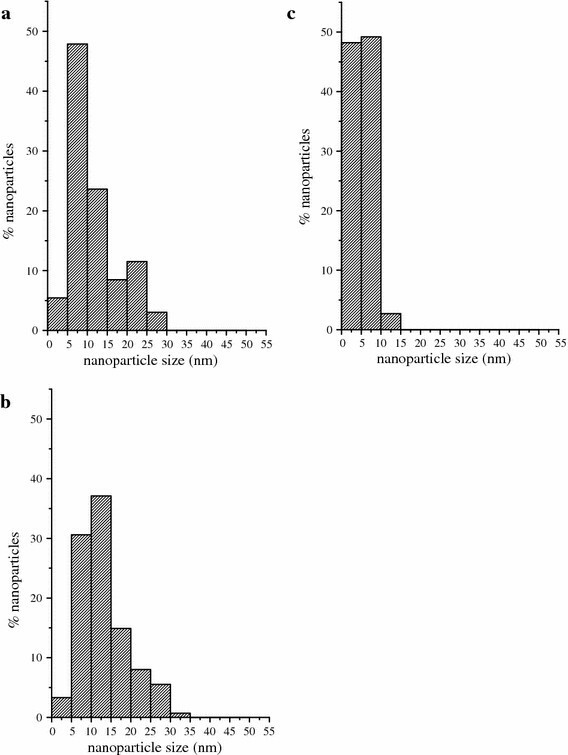 The size distributions of the well-crystallized platinum nanoparticles formed on the chlorine-based hybrid nanomaterial were drawn considering more than four hundred nanoparticles, and they are displayed in Fig. 9. It can be seen that both liquid-phase reduction methods provide a wide range of particle size. Using hydrogen, on the other hand, a much narrower distribution was achieved, and the particles are mostly smaller than 10 nm. The calculated mean nanoparticle sizes are listed in Table 2. Besides the marked distinction in the nanoparticle shapes as assessed by TEM, a dramatic difference in their size is confirmed. The results evidence that the procedure based on hydrogen as a reducer is the most suitable to prepare a size-controlled synthesis of metallic platinum nanoparticles. It is possible to synthesize metallic platinum nanoparticles–vanadium oxide nanotubes hybrid by wet impregnation procedure without any harm to the one-dimensional nanostructure. The size and shape of the metallic nanoparticles may be determined by rigorously controlling the reduction conditions, especially the reductive agent. Conventional procedure based on hydrogen stream leads to well-dispersed nanoparticles with a 6–7 nm average size. The authors FLSM (382.925/2007-6) and AMDF (381.007/2008-1) would like to acknowledge PCI/CNPq for the fellowships. The financial support from CNPq is also acknowledged.